So you want to try sous vide cooking? Our Ultimate Sous Vide Buying Guide is here to help. We're going to show you what to look for, what special features are available and make recommendations about which model will be best for you. Before we start looking at different sous vide machines, we need to have a basic understanding what sous vide cooking is, and how it works? Sous vide cooking involves placing food in a heat proof bag, removing all of the air, and cooking it in a heated water bath where the water is circulating. The advantage of cooking this way is it enables you to cook your food to a very precise temperature without needing to monitor it constantly, adjust the heat, or worry about over cooking your food. You can read more about cooking sous vide in our How to Cook Sous Vide or our Beginners Guide to Sous Vide Cooking articles. Sous vide cooking is an easy way to serve better tasting food to your guests. 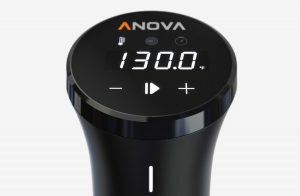 Our top recomendation is the Anova Bluetooth Sous Vide, you can read complete reviews of all of the models we looked at on our Sous Vide Reviews Page. See our all of our Sous Vide Reviews. We reviewed 33 different Sous Vide Precision Cookers from 14 different manufacturers. The consumer level prices ranged from $55.99 to $231.30 with an average price of approximately $100.00 . 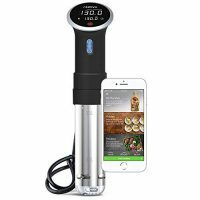 The highest rated model was the Anova Bluetooth Sous Vide for 129.00 . The power of a sous vide immersion cooker is measured in wattage, the more wattage a model uses the faster it will bring the water bath up to temperature. There is a downside to power though, the more power a unit has the more you have to be concerned with evaporation. If you are cooking something for more than 2-3 hours evaporation is a concern, so you'll need to watch and keep the water between the minimum and maximum levels. The controls and display on a sous vide determine how easy it is to set up and get started cooking. It will also let you know what's going on and how close you are to your target temperature. Most of the controls are fairly minimal, with a power button, a button to let you switch from one function to the next and a scroll wheel to set the temperature and change your selection. A large easy to read display makes it a lot easier to work with. The display on the Nomiku WiFi Sous Vide was by far the easiest to read. After that the Anova Bluetooth Sous Vide and Anova Wifi Sous Vide were also very easy to read and use, as was the Gourmia Sous Vide GSV138. The ChefSteps Joule Sous Vide was the only model that didn't have a display, that information is only available via an app on your phone. Many of the models had built in timers, but due to the minimal control settings, setting the timer on the unit itself was a frustrating experience that was always harder than it should have been. We recommend using the app or a standard kitchen timer instead. The different specifications on a sous vide cooker are what really sets each of these models apart from one another. We'll explain what each feature means and why it's important. Water Capacity: Water capacity is the highest volume of water each model can heat, most models can heat 5 gallons which will be fine for almost everyone. GPM: Gallons Per Minute or GPM measures how fast the water moves around in the water bath, the faster the water moves the more quickly it will come up to temperature, and more easily it will maintain that temperature. There is a downside to a high flow rate, the higher the flow rate the faster the water evaporates. Minimum and Maximum Water Levels: Each of these models has a minimum water level and a maximum water level and you need to keep the water between those levels for it to work properly or it will shut down. The wider the range between the levels the better. If you have a model with a higher wattage or flow rate this becomes a more important factor. Maximum Temperature: This represents the maximum temperature the unit is able to achieve for the maximum amount of water it is able to heat. All of the units we looked at are able to achieve temperatures over 200°F, and since most of the cooking occurs in the 135°F to 180°F range this isn't a concern (see our Sous Vide Temperature Chart for more information about cooking times and temperatures). Bluetooth and Wifi Connectivity: Bluetooth and Wifi connectivity is one of the more interesting features available on many sous vide machines. It's not something you absolutely need, but many times it's easier to set the controls and timer on the app than on the physical unit. The ChefSteps Joule Sous Vide doesn't have any physical controls on the unt itself and is only accessible via the app. Bluetooth has a much smaller range and is available on the Anova Bluetooth, Anova WiFi, and Joule models. The sous vide models with WiFi bring your appliances into the Internet of Things era, and as long as your WiFi network is working it will allow you control your unit from anywhere, this does introduce some Sous Vide Safety Issues you should be aware of. Physical Size: The physical size of a sous vide circulator usually isn't that much of a concern for most people. Most of the units we looked at were tall, slender tube designs. Attachment Clip or Clamp: The attachment clamp or clip is one of the features many people overlook when shopping for a sous vide machine. The Anova Bluetooth Sous Vide and Anova Wifi Sous Vide had a clamp design that was the most flexible allowing you to fully adjust the height of the unit within the cooking vessel making it much easier to stay within the minimum and maximum water level markers. When consumer level sous vide machines first came onto the market a few years ago they were in the $300 to $400 range, which meant not everyone could afford one. Today the prices have come down considerably, the models we reviewed were between $55.99 (Magic Mill Souvia Sous Vide) and $231.30 (Nomiku WiFi Sous Vide) at the time of testing. The average sous for the 33 sous vide models we reviewed was approximately $100.00 . 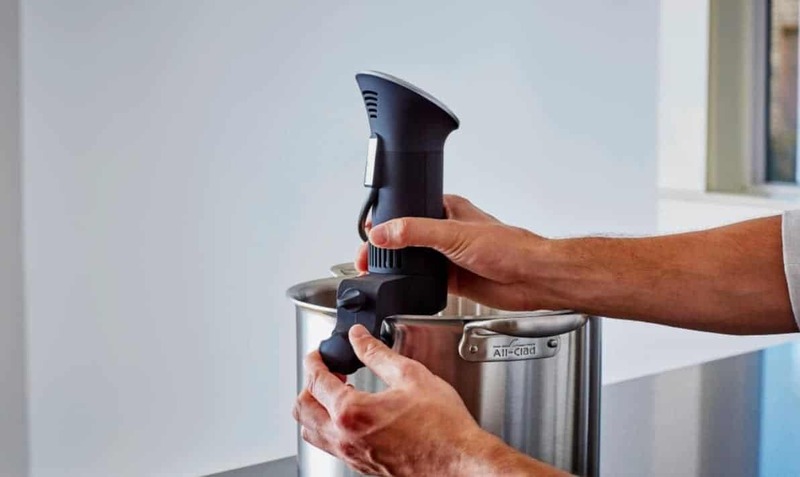 The Anova Bluetooth Sous Vide Precision Cooker is our higher rated sous vide model, it strikes a perfect balance between quality, features, and pricing. It's the perfect choice for almost everyone. The Monoprice Sous Vide Cooker is an average quality precision cooker, if you can buy it when the price is $60 or less it's a great value, otherwise make another choice.